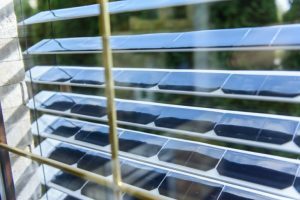 Newly invented solar blinds can keep out the heat of the sun while powering the cooling devices in your home. SolarGaps solar blinds are perfect for people living in apartments, rental houses or who just don’t want solar panels on their roofs. They can meet up to 70 percent of the average American family’s electricity needs. The blinds automatically track the sun and adjust position accordingly. They can be controlled by your smart phone andset up as the main power source for your home. Extra electricity can be stored in a battery or you can get paid to put it back into the grid. You can pre-order a small set of blinds for $390 on SolarGaps website. Hi! I want to be a wholesaler of your window blind solar products. How many comes in a small set? I would prefer verticals as they are much easier to clean. I am not a fan of cleaning horizontal blinds. Im interested. Do they work with indirect light? I live in a condo. No direvt light. I would like to sell these. I want to sell these with my new company. Where can I get them? As a IEC Expert in DC Power standards weve been enjoying this sort of self Employment technology for a decade. We believe anyone should the Power2choose the Energy given to US by Nature on our own property first, buying grid Power only as needed thereafter. Wow can’t wait. I know how to wire them up. I just need the pre made blind. I am interested please message me. Since it appears they are installed on the outside ~ what about strong winds? Do you have U.K. outlets or shipping? Can they also power electric baseboard space heaters? It goes right into the order it’s out giving you a full explanation and details. Deal killer for me. Interested for more information and do you have a brochure available? I assumed that these were going to be installed indoors replacing currently installed blinds. In Michigan for example that would be very preferable. Yes or no? These look great! When can we get them in Australia?